Final Salute Officer Pitts. Thank you for your service. You are a hero. Rest peacefully in the presence of God. We are praying for the family and fellow officers. I had the pleasure of meeting Rob when visiting Terre Haute many years ago. What a gentle soul, a big man with a bigger heart. Such a tragic waste of everything that is decent in humanity. So desperately sorry for everyone who lived and worked with him. Rest in Peace my friend, and let us all try to remember the good and great things he did whilst with us. Teachers and Police Officers. No one ever achieved anything without them. Metropolitan Police, New Scotland Yard, London. Officer Pitts we thank you for your years of bravery and service. May God welcome you and give comfort to those left behind. Cattaraugus Co. NY Sheriff's Depart. 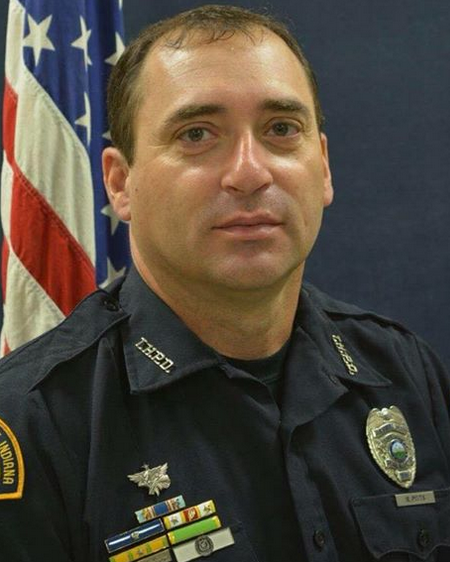 Deepest Sympathy to the family of Officer Pitts and to his Brothers and Sisters of the Terre Haute Police Department Indianna. May GOD welcome Officer Pitts to Mansion of many rooms. Red RoseLodge FOP#16Lancaster Co. Pa.
R.I.P. brother. My condolences go out to your agency and co-workers along with your family. To Police Officer Rob Pitts' family, friends, and our brothers and sisters on the Terre Haute Police Department, our heart aches for you all. You are in our thoughts and prayers. Rest in Peace Sir. It will sure be a very sad Mothers Day for Officer Robert Pitts as he lost his life with a suspect who was wanted for murder. My thoughts and prayers are with the family, the City of Terre Haute, IN, the Terre Haute, IN Police Department and the entire state of Indiana. I am sure this suspect is hiding out somewhere in another state channeling R.D. Taylor who had a hit with the song "Indiana Wants Me" and he knows he will be or already is caught by law enforcement. Pitts family and friends may God grant you all with a speedy healing. Officer Pitts thank you for your service to your Community and to your Department. Most of all thank you for your Ultimate Sacrifice during the line of Duty. Prayers to the family of this fallen officer. May God Bless is my prayer. Rest peacefully Officer Pitts I will keep you and your family in my prayers. Rest in Peace! Thoughts and prayers for your family, friends and co-workers.